Home Chef is a middle priced meal kit service furnishing easy-to-cook meals catering to all-American tastes. It’s a solid choice for people who want to get something tasty and not overly complicated on the table. It’s reasonably priced and some of the dishes are very good. However, overall, I wasn’t excited by the offerings. Home Chef offers quite a lot of flexibility with their plans. They have kits for 2, 4 and 6 persons and you can get from 2 to 6 meals a week. Meals costs $10 per person per meal (so 3 meal kits for 2 a week will cost you $60), and shipping is free for orders of over $45, otherwise it’s $10. This means that if you order only 2 meals for 2, you’ll end up paying $50. Premium meals cost extra. Home Chef also offers “5 minute lunches” with pre-cooked ingredients for $8 a serving, and smoothies and fruit baskets for $5 per serving that you can add to your weekly deliveries. Like other services, Home Chef provides incentives for signing up. Use this link to save $30 off your first box, or go directly to the site to get the most current offer (currently $20 off each box for four weeks). 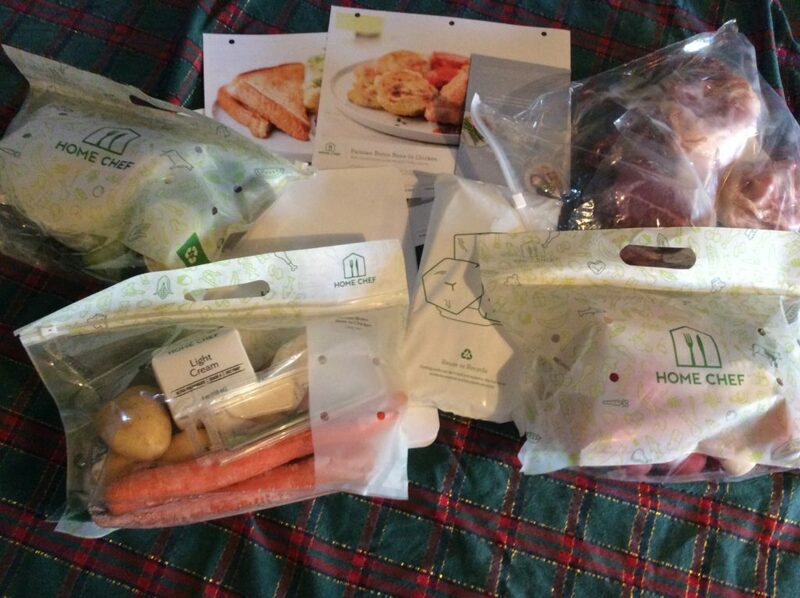 Home Chef offers 13 meal kit choices weekly, including at least 3 vegetarian options. They don’t offer vegan options – unless the vegetarian kits just happen to be vegan. They don’t cater to any specific diet either. The meals tend to be slightly upscale versions of basic modern American food. They include burgers, pastas, rice bowls, tostadas, flatbreads and baked chicken/salmon/pork chops with vegetable & starchy sides. Few of their recipes have exotic ingredients. Home Chef is now offering the ability of slightly customizing some recipes by substituting the protein with another choice (for example, getting ground pork instead of beef strips or ground turkey, or getting a smaller amount of antibiotic-free chicken instead of regular chicken). This should give some flexibility to people who simply don’t like some proteins. Premium meals are not yet available every week, but when they are, they usually consist of fillet, scallops or even lamb chops. They cost up to $20 per portion (so yes, a meal for two would be $40). The quality of the ingredients I got was pretty good, but Home Chef does not specialize in sending organic ingredients. While I enjoyed the meals I got from Home Chef, it’s not my choice for a long term service because the choices just don’t seem very exciting to me. Plus as most of their meals don’t usually require exotic ingredients, I can make them at home using my ingredients for less. Home Chef scheduled meals to be delivered at my house on Tuesdays. They can arrive between 8 AM and 9 PM, so you are better off not planning to cook them that night. Personally, I prefer kits that arrive on Monday to give me more flexibility as when I cook them during the week – I don’t like to get to the weekend and feel rushed to cook a meal kit before it goes bad. 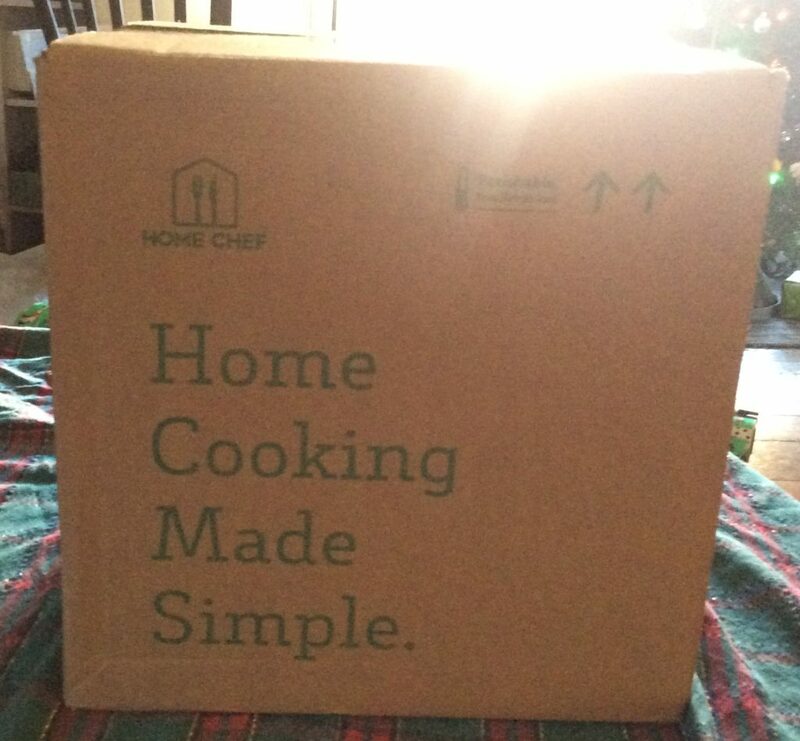 A bigger problem with Home Chef was that while my first week’s box came without a hitch, the second week’s box never appeared! They sent me a notification that it was on its way, they sent me the tracking, but it never arrived. Fortunately, customer service was very helpful and they refunded my purchase. 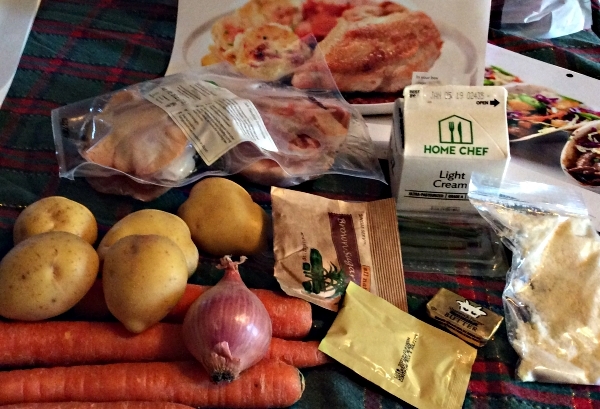 Home Chef sends its kits in a standard cardboard box. Like other services, the box has a liner (not pictured). While Home Chef says that the liner is made of recycled cotton and denim, it apparently cannot be recycled back or added to the yard waste/compost bin. That means it takes space in the trash can – and the landfill! Fortunately the freezer packs, which are also disposable in the trash, are smaller than those of other companies. 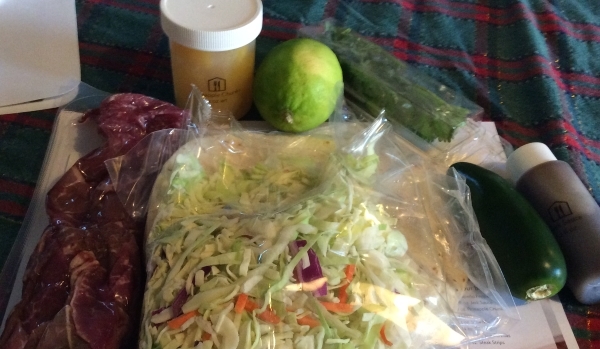 Most of the ingredients for the meals come in zippered plastic bags (though beware that the zippers break easily). The meats, however, are between freezer packs. This is a handy way of keeping all ingredients together – though it does mean either refrigerating them all, or taking the ones that don’t need refrigerator out of the bags. With your first order, Home Chef sends you a folder and recipe cards come pre-perforated so that you can keep them in it. Really, really delicious. I’ll make it again. I wasn’t fond of the jerk sauce, but liked the slaw. All in all, I was happy with the service. Cancelling was very easy and quick, it’s done online. Home Chef preserves your account, so that it’s easy to resubscribe again. Home Chef’s offers some incentives to resubscribe. Twice they e-mailed me giving me a $10 credit – which they seem to be adding to the $10 credit I already had (which has not gone away!). More recently, they offered me the same deal they are offering new subscribers: $20 off per week for four weeks. Alas, when I looked at their menu I didn’t find much that excited me, so I decided to re-subscribe to HelloFresh and alternating it with Blue Apron for a month or so. I will make more Home Chef recipes to get a better feel for the service, however. I didn’t get any meal kits this week, so I decided to hack a Home Chef recipe for dinner. I wanted something with chicken, as I’m trying to eat less beef, and this one seemed simple enough. I love coq au vin (which I haven’t made in a while). and while, obviously, you can’t make coq au vin in an hour, I was willing to give this recipe for Coq au Vin with Bone-In Chicken & Mashed Potatoes a try. Alas, once I started making it, I realized there wasn’t much to it: you make mashed potatoes, you sear and then bake the chicken, you sautee the mushrooms and pearl onions, you make the 2-two ingredient sauce and voila! The results were good, but not great – though that may be because I actually used chicken breasts instead of the thighs I prefer and because I didn’t make enough sauce for the massive breasts I got (lord, that sounds dirty!). 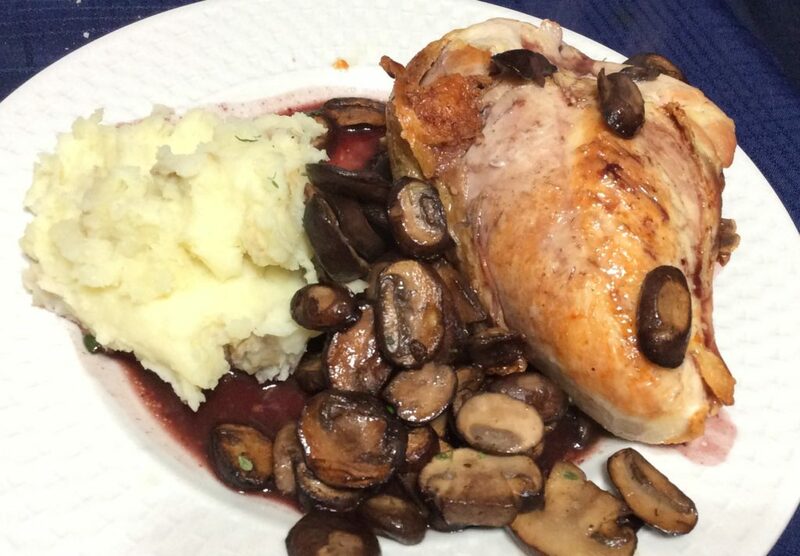 The sauce, which was tasty enough, consisted of 2 tsp of chicken demi-glace dissolved in 5 oz of red wine. I used beef demi-glace, as I didn’t have the regular kind. 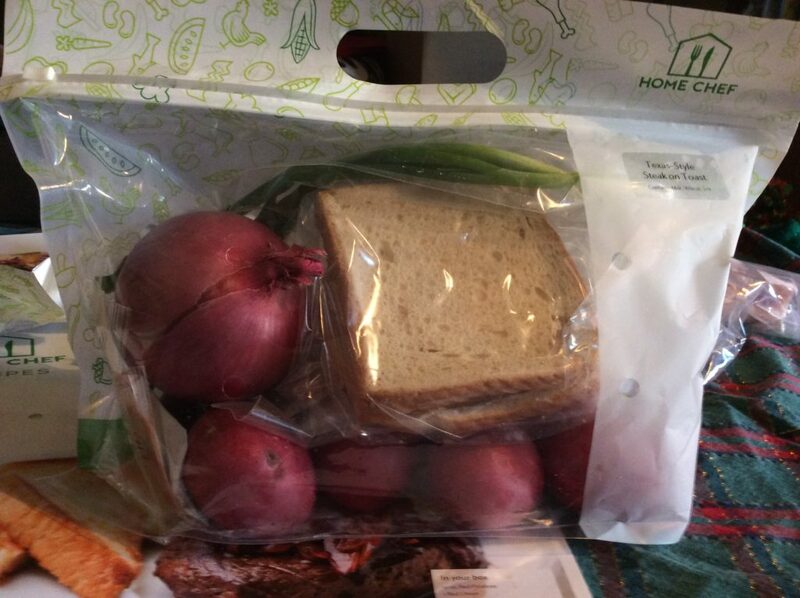 I also didn’t use pearl onions because Safeway failed to deliver them to me. In all, I spent $20 to make this meal, which actually fed 3 of us with leftovers (those were really big chicken breasts) – so about 1/3 less of what the meal kit would have cost. I also went out of my way to look for “antibiotic-free” chicken, only to find out that California passed a law to ban the use of growth-promotion antibiotics in chickens. Antibiotics can only be used if a veterinarian prescribes them to cure a specific ailment. So it would seem that any “antibotic-free” designation on chicken raised in CA is just for advertising purposes. I had wanted to see if antibiotic-free chicken tasted better than regular chicken, and obviously I found out it didn’t. I did find out, though, that searing the chicken skin-side-down for a couple of minutes and then baking it at 400F, leaves you with a very nice crispy chicken skin. 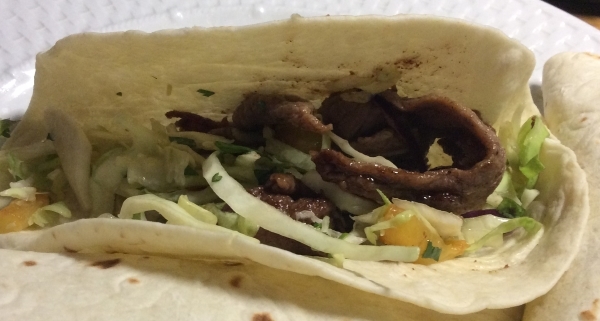 Last week, it was my time to sample Home Chef meals, and all in all, they did pretty well. 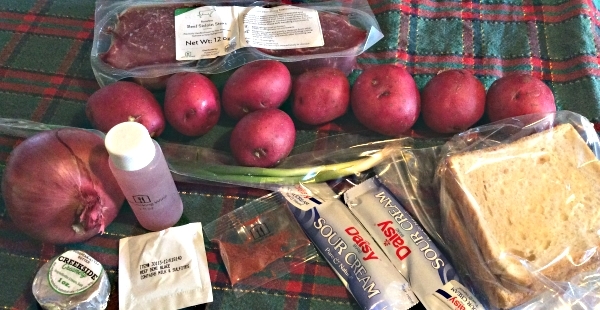 This kit for Texas-Style Steak on Toast with smashed red potatoes and red onion gravy not only produced a very tasty meal, but it taught me recipes/techniques that I didn’t know and would use in the future. First of all, who would have guessed that white bread brushed with olive oil and sprinkled with a tiny bit of salt before baking in the oven would be so tasty? Of course, I’ve made crostini plenty of times, but the white bread seems to incorporate the flavor of the oil and remain soft inside in a way that crostini doesn’t. 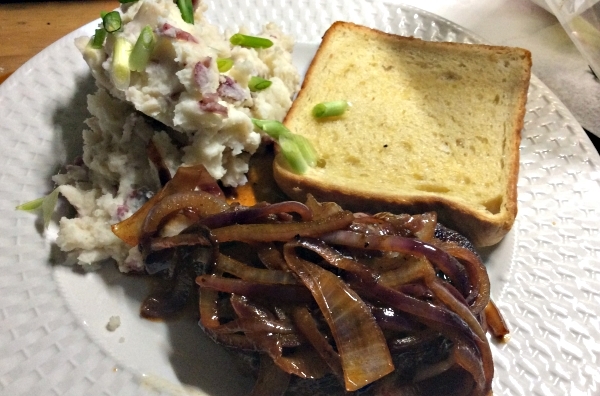 The steak itself was better than I would have thought, and I enjoyed the onion sauce very much. Once again, demi-glace showed its power. I usually make mashed potatoes with large russet potatoes that I peel before boiling. I really enjoyed the convenience of making it out of small red potatoes that I only needed to half before cooking. It was a much faster approach (plus I hate peeling!) and the resulting mashed potatoes were very good. The peel actually included some festive color to them. I’m considering using this recipe to make mashed potatoes for my Christmas Eve dinner, but I’m not sure they’ll keep as well as my regular mashed potatoes. 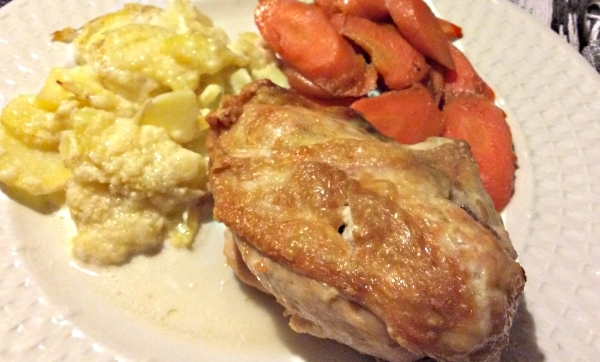 The meal was simple to cook and the portion was adequate – in particular because mashed potatoes are filling. I got my first week of Home Chef at a discount, so I paid only about $10 for this meal. Regular price would be $20 – which is a better deal than other home meal kits. Wash potatoes and then cut in half. Place potatoes in a cooking pot and cover with about 1″ of water. Add salt. Bring to a boil, then reduce heat and simmer for 15-20 minutes, or until the potatoes are tender. Drain the potatoes and return them to the pot. Mashed them with a potato masher, then add sour cream, butter and salt to taste and mix well. Serve, garnished with the sliced green onions. Heat olive oil over medium-high heat. Add onion and saute, stirring occasionally, until it starts to caramelize, 6-8 minutes. Add paprika and red wine and continue cooking until the red wine has almost evaporated, 2-3 minutes. Mix together the demi-glace and 1/4 cup of water and add to the pan. Lower heat and simmer, stirring occasionally, until it thickens, 2-3 minute. Serve over steak.